How are you doing today? We are getting ready to head to my brother's college graduation in Chadron! He called yesterday and informed me there is a chance of...SNOW tomorrow! Guess I will be digging out winter coats to pack along today! A huge THANK YOU to all of you who helped us celebrate our 6 month anniversary! We had so much fun getting to visit with you and look forward to the next 6 months! The Primitive Gatherings, Lakeside Gatherings Woven line arrived. 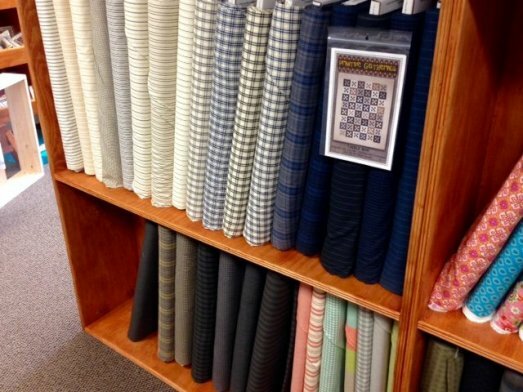 If you are looking for some wonderful fabrics for a guy quilt, check out this line! The creams, navys, grays, and yellows will make a beautiful quilt! We have picked out the pattern Tackle Box to go along with them. 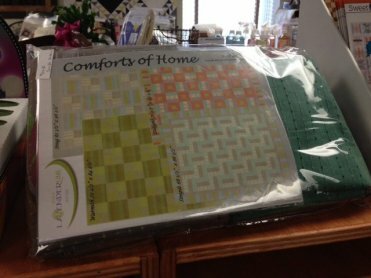 We have a couple new quilt kits using the woven fabrics available! One uses beautiful turquoise, gray and cream, and the other uses coral, turquoise, and green. Stop in and check them out! We are gearing up for a Christmas BOM program! 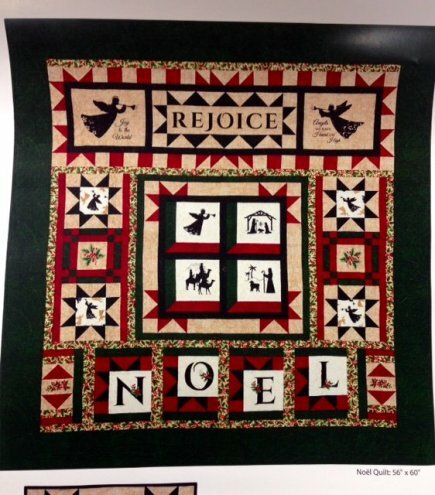 This Noel quilt by Wing & Prayer measures 56" x 60" and will be a 4 month program and will start in June. If you have interest in joining us for this, please email us at juststitchin2014@gmail.com or call the shop at 308-344-9389 to have your name added to the list. We will know next week how much it will be monthly. Please note, next Saturday, May 16th, the shop will be open 9 to 12! Well I'm off to get two kids packed! Have a safe and blessed weekend!